Ekam can help you bring the spa experience home with their range of home and body care and aromatherapy products. 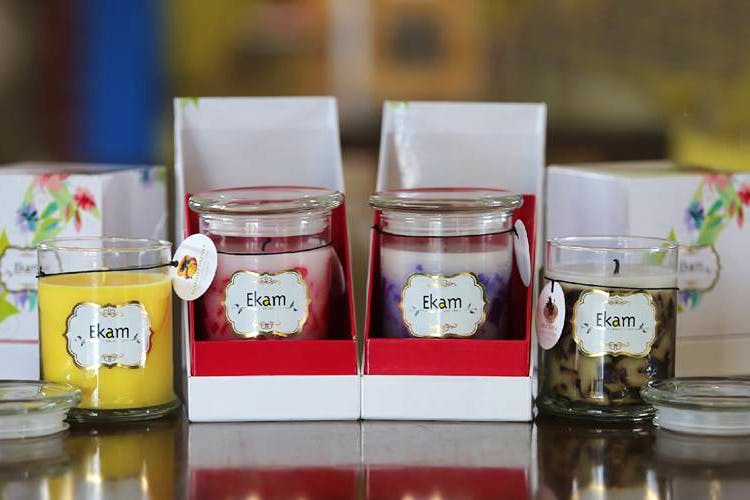 Scented candles, aromatherapy at home or in the car, and even for that home spa experience, Ekam has you sorted! From massage and essential oils to rejuvenating body scrubs and even diffusers, this brands is really a slice of a spa. Their scented candle range should be enough to have you feeling pampered with scents like vanilla cookie, mango papaya, fresh cotton, cinnamon, and classics like lavender and lemongrass. For earthy scents, they have mahogany, driftwood, and a line of soya candles. Candles not your scene? They have a range of fragrance oils, room sprays and wax melts as well (to be melted in oil melters, which are also available at the store). In their bath and body collection they have face scrubs, body washes and soap bars in refreshing scents like tea tree and ginger lime (and charcoal) as well as moisturisers and body mists for when you can’t get your hands on your favourite international brands. All their products are apparently 100% vegetarian and ethically sourced, so feel free to pick up what you need without guilt. We recommend going there with an agenda, or else you’ll end up picking more than what you need! Pick up one of their gift boxes if you’re unsure of what to buy. Best case, you’ll figure out what you like and come back for more, worst case, it makes a great present!